It all started as a conversation in 2008. My dear friend Eppie's father was ill. When I asked if there was anything I could do, she told me that he found comfort in prayer ~ and that her whole family were in the habit of praying around his bed. Then she said one of their favorite prayers was The Chaplet of St. Michael the Archangel. I felt a familiar warm tingle around my heart, and I knew that this prayer was something that I needed to learn more about. 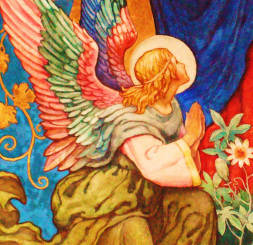 Thank God (and Google) after a short search I discovered the text for this moving and truly beautiful devotion that through the powerful intercession of St. Michael, invites angels from the nine choirs into our hearts and lives. Soon, I had printed copies of the prayer to share in our church Adoration Chapel and with friends and family, but something was missing. I had recently started listening to prayer recordings while driving. The radio always seemed to be full of dire forebodings about the economy, the crime rate or songs with words that made me blush, and my mind left to its own ramblings often dwelt on sad thoughts or worries and concerns. I decided to exchange that fallow wasted time for conversation or communion with God, turning my mind to something that would uplift and build my spirit while at the same time effectively stopping the hamster-wheel-spinning of fretful thoughts. Now, I started a search in earnest for my new favorite prayer to add to my growing car collection but was sadly disappointed. The only copy I could find was a video of Mother Angelica ~ and while it was beautiful, it was not available as an audio CD. In November of the same year, I met a new friend Wanda who I shared a delightful dinner with. During our conversation we discovered that we both liked The Chaplet of St. Michael but what surprised me was that she said she listened to it everyday in her car. How was that possible I asked? She said that she had simply recorded her own voice and she was certain that if she could do it, so could I. The familiar tingle crept back into my heart and I called my Mom, Nancy and sister Heather to share my seed of an idea . I was so buoyed by their enthusiasm that on December 10, 2008 I wrote in my Ideas Journal that I would make this leap of faith and record the prayer. Life promptly stepped in with managing a construction company, caring for children and a home etc and it remained just a hopeful sentence on a lovely lined page. 2009 brought many changes to my life and one of them was that my husband accepted a job in Dubai, half-way around the world. I had to learn to depend on myself and step into the responsibilities that he could not manage from such a distance. One of these jobs was dealing with rental offices that we owned ~ collecting rents, negotiating leases, working with tenants. It was during this time that I met Jonathan Halls. During a routine visit to his office we somehow got onto the subject of prayers and angels and I launched into my idea to record The Chaplet but that I had no idea how to start. He smiled a very warm smile and said I might want to step into his workroom. The workroom turned out to be a recording studio. God is truly amazing at engineering these "seeming" coincidences. Jonathan quickly scanned his calendar and suggested the following Friday, May 15 th for a recording session. The whole experience was such a pleasure and a revelation that I knew I wanted to continue this journey, discovering beautiful, unusual or under-appreciated prayers and sharing them from the heart. Suddenly, a lovely engraving came to mind ~ a print that I had seen of angels kneeling with the chalice and host. The inscription on the picture said Panis Angelicus ~ Bread of Angels; blessed food for our's soul's growth and sustenance, and I knew in that moment it would be the perfect name for publishing the recording. Panis Angelicus Press was born and The Chaplet of St. Michael the Archangel became, thanks to the talented Amy McRae, first a short 6 minute video on YouTube and then a full-length DVD. In the fall of 2010 I recorded Regina Angelorum ~ Our Lady Queen of Angels, a collection of beautiful and uplifting prayers for Mother Mary ~ which also became a YouTube video and full-length DVD. I am currently recording the complete text of the book All About the Angels by Father Paul O'Sullivan, a delightful and informative book about the angels and how they support us in our daily lives. In my life this is certainly true, being touched by a powerful & compassionate archangel, Michael. May you always be guarded, guided, blessed and protected by God and his mighty, loving angels.